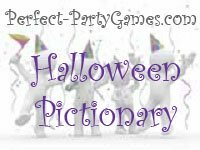 Summary: Halloween Pictionary is played just like regular Pictionary, except you use Halloween words. Mummy, Tombstone, Bats, Vampires, Jack-O-Lantern, Spider, Witch, Black Cat, Candy Corn, Full Moon, Goblin, Skeleton, Broom, Cemetery, Ghost, Pumpkin, Vampire, Werewolf, Monster, Web, Rat, Blood, Scarecrow, Headstone, Demon, Candy Apples, Calderon, Zombie, Frankenstein, Mask, Costume, Haunted House, Full Moon, Candles, Fog, Fangs, Sword, Bones, Wand, Grave, Midnight and Coffin. Put the slips of words into the plastic pumpkin and set up the drawing surface for all to see. One team sends a person up to the board. The player takes a word from the pumpkin that they must draw. Then their team mates have to guess what the word is. The team may begin guessing as soon as the picture is being drawn. The player drawing the picture may not say even one word to help. This is also not a game of pantomine so the player who is drawing the picture is not allowed to use hand or body signals to help describe the picture they are drawing. Set a 2 minute time limit for guessing. The other team goes next. Keep rotating until everyone has a chance to draw. You can keep score and have one team win, or just play for the fun of it. This is also a fun game to play using titles of horror films. Do it the same way but use movies like Halloween, Dracula, The Wolfman or any horror film.